I was standing on a crooked stump. WiFi: Yes. Pay per hour/day. Self-Service Kitchen: Yes. Plenty of utensils/equipment. Lockers: Cabinets near beds. Bring a lock. Location: Not the worst, but definitely not the best. At the top of an ENORMOUS hill. About a mile from Bath Cathedral and the ancient Roman Baths (all the way down the hill and a few blocks from there). You're not allowed to park near the hostel. You have to park on the hill and it's not ideal. We stayed here for one night. It was quite crowded and we stayed in a large, packed dorm room. If I remember correctly there were at least 10 beds and our room was full of loads of friendly people. There is no parking at the hostel except to drop off bags. There is a killer hill leading to the hostel and the driveway is a large hill as well. There was street parking at the end of the long driveway. All tourist locations were at the bottom of the hill. 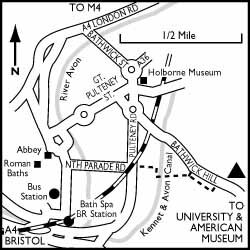 It was about a 30 minute walk to the Roman Baths and the Bath Cathedral (which are right next to each other) as well as the spa with the actual hot springs. We were not close enough to walk to the Royal Crescent. The hostel had a foreign school group that were loud and took over much of the hostel. There was a large kitchen and dining area. I believe there was a store as well, though we brought our own food and cooked for ourselves. The beds were comfortable and there was a small bathroom inside our room and a large one just outside and down the steps. It was clean but much more urban than the two hostels we stayed in prior to this (Salisbury & Penzance). I think this was a shock for my mother, whose experience with hostels was only the prior 3 nights. It was affordable, about £16 for the night. It's certainly not on my top hostel list, but I would recommend it. BUS: 100m Take the #18 or U18 Bath University Buses from outside Sainbury's opposite the bus station. 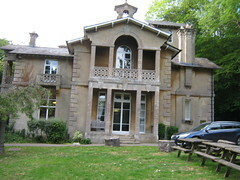 LOCATION: 1 mile from City Centre, follow signs for "University of Bath"